The best part of being organized is having everything you need in one place. When you have a well stocked knitting or crochet tool kit, you’re prepared for any curve ball your pattern may throw at you. Luckily, my co-workers here at WEBS are a lot more organized and prepared than I am! They’ve shared with us their tool kit essentials. Dena keeps two tool kits. One larger, main tool kit with all the essentials, and a mini kit with the bare necessities when she wants to travel light. On the right, Dena’s mini tool kit includes: Clover Locking Stitch Markers, small ring markers, a tape measure, a crochet hook, two sizes of Clover Bent Tip Tapestry Needles, small scissors, and dental floss. She uses the dental floss as waste yarn and lifelines for lace knitting. So clever! On the left (her main kit), Dena has her full set Addi crochet hooks, scissors, Clover Soft Stitch Ring Stitch Markers, locking stitch markers, Clover U Cable Stitch Holder, a tape measure, highlighter tape, tapestry needles, Nancy’s Knit Knacks Needle & Hook Gauge and Knit Kards. Highlighter tape is perfect for keeping track of your place in a pattern. You place the tape over the row you’re on so you can easily see your place. Then, you just peel off the tape and move it to your next row! Greta’s tool kit is in the center. She keeps everything tucked away in her Spud & Chloë case. The case has since been discontinued, but the Namaste Lola Case is a similar size. Her essentials include a crochet hook, stitch markers, a yarn needle for weaving in ends, a needle gauge, a cable needle, and pin cushion for sewing needles. 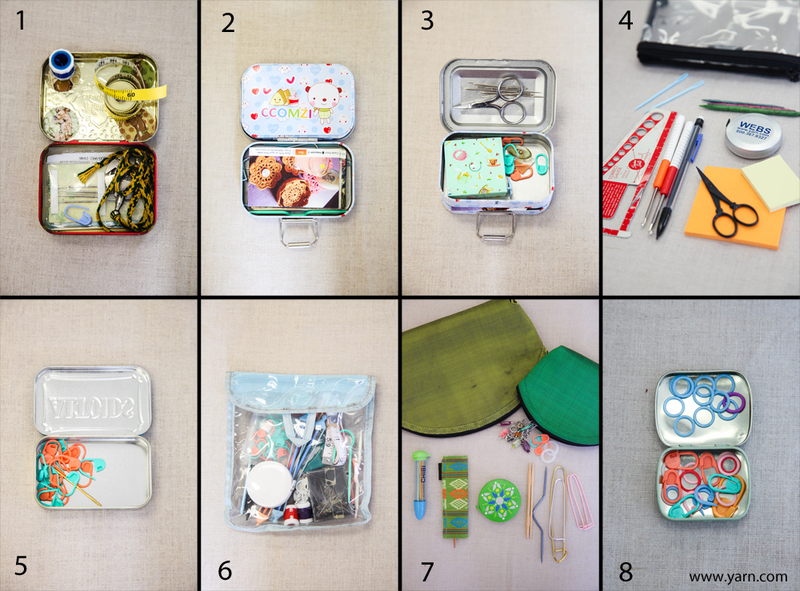 1: Kristin’s tool kit is an adorable vintage chocolate tin. She keeps a row counter, a tape measure, locking stitch markers, darning needles and a yarn cutter pendant. They snip your yarn neatly and don’t have any pointy tips that can poke you. 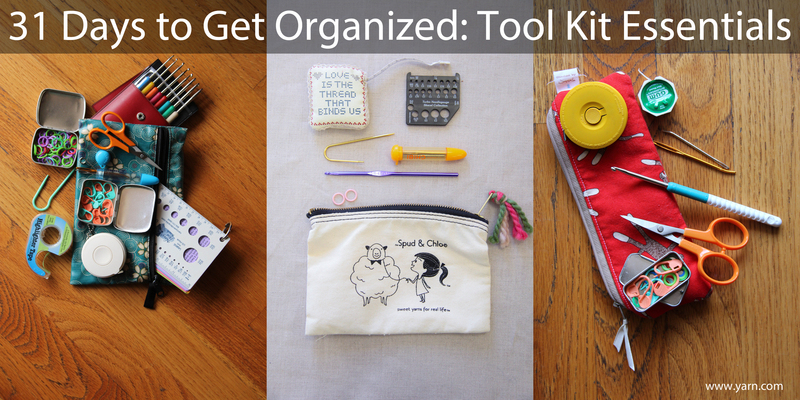 2 and 3: Sara is so organized, she has two tool kits. She puts my organizational skills to shame! Her tool kit has a small magnet in the lid that all her needles stick to (out of the way so she don’t get stabbed!) She has a tiny pair of scissors, a tape measure, stitch markers and a few random buttons in the top compartment. In the bottom she keep extra darning needles, her business cards and a larger cable stitch holder. 5: Mary sticks to the bare necessities. She keeps stitch markers and a yarn needle with her. 6: Stephanie likes to be prepared, and keeps practically all her notions with her at all times! She has locking stitch markers, stitch holders, two kinds of tape measures, a pencil, sewing needles, yarn needles, row counters, scissors, a crochet hook, a needle gauge a sewing needle threader and pins. Stephanie and Tina are the only ones here with a pencil in their kit, and it seems like an essential that’s commonly overlooked! 7: Greta keeps her kit in her Lantern Moon cases. We don’t have these specific ones anymore, but these Lantern Moon cases are a similar size. She keeps yarn needles, a tape measure, a stitch holder, a cable needle, locking stitch markers, soft stitch markers and a crochet hook. My favorite part of her tool kit is the Lantern moon cable needle set. It’s beautiful! What’s in your tool kit? Do you like to be prepared for anything, or just stick to the basics? This entry was posted on Friday, January 25th, 2013 at 1:40 pm	and is filed under Tips & Techniques. You can follow any responses to this entry through the RSS 2.0 feed. You can skip to the end and leave a response. Pinging is currently not allowed. I keep mine in an Altoid’s tin: magnet on the lid holding a darning needle, sharp sewing needle and knit picks locking tool. Then there’s folding scissors, tape measure, and two small stitch holders (the safety-pin style ones that “lock”) which have closed stitch holders on one and open-able stitch holders on the other. I also have my Grandmother’s metal ruler/needle guage that I carry around but it doesn’t fit in my tin (I’m on the look-out for one that’s small enough – been thinking of those lovely nautilus ones, perhaps). I do have a larger tool-kit, but this is my bare essentials one that travels with my knitting. I use a school pencil case like this. http://epicplastic.com/plastic-pencil-boxes/ They are two sided and have several areas divided for all sizes of items. I stock it with: pencil/pen, foldable scissors, needlecase for sewing needles and pins, stitch markers (beaded and plastic rings), crochet hook, yarn needles, tape measure, and cable needles/small dpns. Am I the only one with a little calculator in her tool kit? I use it quite often! For light travel, I usually just grab my Knit Kit (which has scissors, double ended crochet hook, flexible stitch markers, yarn needle, row counter, tape measure, point protectors, and thread cutter all packaged neatly together… I feel like I’m forgetting something else), needles and yarn for the project I’m working on. Maybe also a cable needle, depending on the project. For longer travel, like vacation, I keep some necessary notions with my interchangeable needle set. Inside the pocket for those, I keep most of the same things that my Knit Kit contains, with the addition of a needle gauge and cable needle. This setup is what is usually pulled out at home as well. Then the surplus is in my all-purpose knitting kit. It’s a plastic storage box, about half the depth of a shoe box, about as long, but twice as wide. I keep my fixed circs and dpns in their original package in there, along a free Clinique makeup bag for my notions. That holds stitch holders, spare stich markers in a small Lush tin so they don’t flop about willy-nilly (because really, the reason to have spares is because the others got lost, so if I lost my spares I’d be in trouble), crochet hook, yarn and darning needles, blocking pins, dental floss, and care labels for clothing. I use a square bag from the Clinique bonus with scissors, 2 crochet hooks, Chibi case with needles, both kinds of tape measures, stitch markers, thin crochet cotton for life lines, needle sizer, marking pins for seaming, and 3 sizes of cable needles. I keep it beside my chair. For my on-to-go-socks, I pin on a coil-less safety pin and put a darning needle and stitch markers on that. I, too, use a Clinique bonus bag. I keep similar items in mine, but also always a pen. One of my daughters is a knitter, but doesn’t have the time or space to do much regularly. At a loss for ideas for her 23rd birthday, I got her a beautiful silk zippered bag from WEBS and filled it for her; her very own knitting tool kit! it was one of the most successful birthday presents ever!! My desktop, laptop, & phone all have calculators so I no longer have any need to carry around a calculator. I use the calculator on my phone every day. 15 years ago, sure, I would have put a little one in my tool kit, but they are obsolete. In fact, I don’t know what to do with my old calculator, which is still taking up space in a desk drawer. I purchased a knitting tool kit from an etsy shop, that is the size of an Altoid tin. The mini scissors didn’t last lone but everything else works just fine. I carry dental floss in my kit or purse. The cutting edge has always worked for cutting yarn and I never have to worry about zealous security workers confiscating it. (I’ve had the tiny sewing repair kit scissors taken only to see them sold in the shops on the other side of security). I also use pencil cases. I do like the idea of the clear bags. I have one main sewing basket that I throw my notions in. I use it to restock three or four mini kits that I have in several bags. I usually use an altoids or other mint tin or a small gift card tin (they have pretty designs or flat tops and are just a bit bigger than altoid tins). They usually hold: tape measure, scissors,needle coils, fix-a-stitch dropped stitch grabber thing, needle stoppers, stitch holders, all different kinds of stitch markers put on a large safety pin, spare large safety pins for stitch holders or whatever, cable needle, interchangeable locking tool with at least two needle ends, sewing needles, and darning needles. I like to keep on kit by where I sit on the couch to knit, one in my purse and the other two get thrown in whatever project bag I’m using as needed. I found I like the gift card tins better because even though they’re bigger than an altoid tin in leaves just enough room to adapt it to whatever project I’m working on without being too much bigger. I have a bin with everything that sits on top of the stash bins. But for in my knitting bag, I use a small 7″ clear-front zipper pouch from Chic-a. It has sticky notes and a pen, a 2″ square gauge square, a needle gauge, a tape measure, a Clover Kacha-Kacha row counter, 2 metal cable needles and 3 wooden cable needles, a crochet hook, a Clover Chibi holder with blunt & sharp yarn needles, locking stitch markers, regular stitch markers, a small pair of scissors (with a cover over the blades to avoid accidents), and a couple yards of left-over sock yarn for holding stitches or making a life-line. The only things I can add is a bunch of safety pins – I thread as many as I can onto one. I fly a lot, so use these to capture a drop stitch, as stitch markers, even row counters. Flight attendants have asked why I have 4 pins on one side of my tray table, and 3 on the other! I also have one of those hotel amenity sewing kits. I print my pattern onto “recipe card sized” cardstock (I use Excel for this). I also include my recipe size tips, eg kitchener, german short row, whatever I think I need for the projects. These are becoming less important with my small electronics, but they are still in my travel bag for now. Thanks for the post – I’ve just discovered highlighter tape! Hmm it looks like your website ate my first comment (it was extremely long) so I guess I’ll just sum it up what I wrote and say, I’m thoroughly enjoying your blog. I too am an aspiring blog writer but I’m still new to the whole thing. Do you have any tips and hints for inexperienced blog writers? I’d definitely appreciate it.